Beautiful! and so fun when someone else is inspired by the same verse!!! You added a blessing to my day. Wow! That's a gorgeous picture! What a great verse to pair it with. 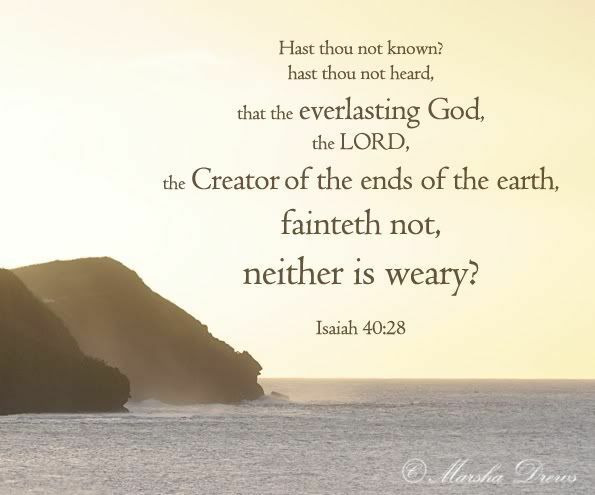 Thank goodness that His strength is my strength when I am weary!! What a great photo capturing His mighty work on earth to go with the awesome power of God captured in that verse! Delightful shot and application of scripture! I hope that you are savoring the flavors of Guam with your family. May your time away be filled with many abundant blessings. You just have no idea how this Scripture reminder ministered to me at this time. Right now I'm really, really discouraged. I found strength in this Scripture. The picture is gorgeous. So peaceful and a shouting testimony of God's goodness and beauty. Thank you for posting this wonderful reminder that no matter what happens in my life, God never, ever leaves or sleeps. Amen. Beautiful picture! sometimes all we can do is learn of the strength of the Lord! I love the lighting in this photo. Beautiful. 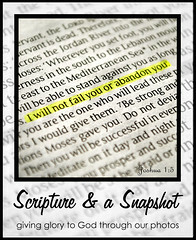 Love this scripture and the photo is beautiful! What a beautiful word picture! What a wonderful message and an absolutely beautiful shot. Gorgeous photo! The scripture makes me think how He never gets tired of us...never. "fainteth not"....I love it!!! This blog hop has been such an encouragement to me today. I love the picture. So gorgeous! One thing I love about Isaiah is that it is absolutely full of the character of God. We often just think of it as a book of prophecy but in my opinion - especially in chapters 40-49 - are just RICH with the attributes of God. I love reading through them and just listing all the attributes that are shown in those chapters - very humbling and very good for putting things into perspective. Thanks for this beautiful, visual display of God's character, Marsha!